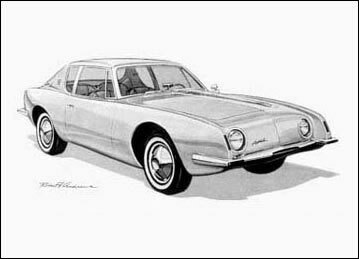 In the spring of 1961, Sherwood Egbert, the new president of Studebaker, hired Raymond Loewy to revitalize Studebaker’s public image to attract younger buyers. Loewy agreed to take on the job, despite the short schedule allowed to produce a finished design and scale model. Loewy recruited a design team consisting of experienced designers and former Loewy employees, John Ebstein and Robert Andrews, as well as a young student from Art Center named Tom Kellogg. The team gathered in Palm Springs and sequestered themselves in a house leased solely for the purpose of developing the new car design. Each team member had a role: Andrews and Kellogg handled the sketching, Ebstein oversaw the project, and Loewy served as the creative director, offering input on the design. His main direction included: Minimize chrome, avoid decorative moldings, accent the wedge-shaped silhouette, stress long, down-slanted hood, abbreviate the rear and tuck it under, above all, think aerodynamics. His objectives also included: Place instrument panel overhead, above windshield as in aircraft, install aircraft-type knobs and levers on the console, pinch the waistline, as Le Mans-type racing cars, design hoods with an off-center panel, accent spacecraft “reentry curve” wheel openings, and simple disc wheels. The team met their tight deadline, and together flew to South Bend to prepare a full-scale clay mock-up. 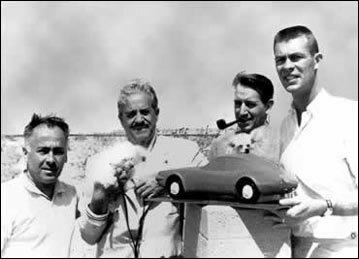 Left to right: John Ebstein, Raymond Loewy, Robert Andrews, and Tom Kellogg. Avanti drawing signed by Robert Andrews.